A great place for all of your pets to play. Fun chute feature brings Rolleroos pets to life. Includes exclusive penny ling panda, Ferret and 2 core cast pet friends…. 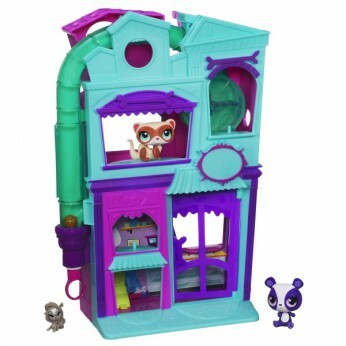 Littlest Pet shop play set lets you launch your rolleroos pets through the pet shop over and over again, load in hamster wheel and chimney and press the lever to unleash them. Friends sit in the cash register. Set includes 2 loveable pets, 2 fabulous friends and accessories. One supplied; Size H35.6, W43.8, D8.3cm; For ages 4 years and over; EAN: 5010994722654. WARNING(S): Not suitable for children under 3 years old. This toy costs approximately £24.99 (for the latest and best prices make sure you check our retailer list for the Littlest Pet Shop Pet Shop above). In our review of Littlest Pet Shop Pet Shop we classed it as being suitable for ages 3 years, 4 years, 5 years but recommend you check the manufacturer specific advice before purchasing.